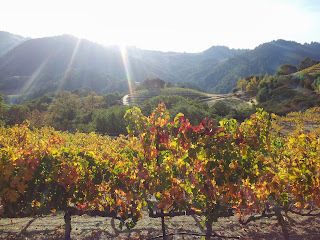 Stag's Leap Wine Cellars: Keeping the Faith? of California elegance has survived the transition to more corporate ownership. Julian Barnes writes an interesting essay in the Guardian on Stoner, the surprise 50-year-old bestseller about an American academic who remains stoic in the face of disappointments. It’s a wonderful book (I’ve just bought half a dozen copies for Christmas presents), written in a minor key. The opening sentences set the tone – ‘Stoner’s colleagues, who held him in no particular esteem when he was alive, speak of him rarely now…’ – it’s rather like a Victorian watercolour, all washed greys and delicate greens, but no less striking for that. But back to Barnes: he makes the point that the novel’s success in Europe (it was published in 1965 and has taken off in the last six months or so – I bought it when I happened to catch Ian McEwan on the radio praising it) is not matched in America. The short story writer Lorrie Moore patronisingly calls it ‘a terrific little book...but minor’, (pretty rich since it’s vastly better than anything I’ve read of hers). Barnes quotes the novelist Sylvia Brownrigg saying its ‘reticence seems very not American… we’re such a country of maximalists’. It makes me think that the much-touted ‘style change’ in California, given momentum by the cool and difficult 2010 and 2011 vintages (I’ve written about it as much as anyone else), is never going to take hold. The reasons Americans like the big, fruity style are so much more than Robert Parker, and Jim Laube in Wine Spectator, championing it in the 80s and 90s. Yes, California can and did produce elegant wines. I've had Spring Mountain Vineyard 79, Inglenook 61 and Newton 81 (all Cabernets) that weighed in at 13% or so, were vibrant and fresh and had many years ahead of them. But were they the norm then? Surely their peers were as hot and opulent as they are now, and the reason we don’t see them is because they’ve fallen apart, or indeed were drunk within a few years of being made? For the style change to become widespread, so much else is going to have to change. American food, for one. I’m not talking about the rarefied Michelin top levels but the mid- to high-end $20-30 main course sort of operation. Ingredients are of the very highest quality but they are so made and each dish is such a cacophony of flavours that a wine has to shout to be heard. I had a rainbow trout the other night that I imagine was delicious – it was beautifully cooked – but it came smothered under a pillow-sized heap of fried vegetables, carrot and bean, cashews, six different kinds of squash, a riot of taste and texture. Anything short of the 15.5%-proof Parador Tempranillo we were drinking would have been swamped. Brownrigg describes the character of Stoner as passive, and suggests that’s what Americans find difficult. So too with wine – the big California style is active, bold, even strident, the wine shoulders its way onto the table in a bottle that demands attention with its weight and heft and a punt that swallows your fist entire. The contrast is restraint, acidity, structured tannins, austere fruit. Wines that don’t shout. But. ‘There are always old boys down in Texas that like the big style,’ a Napa winemaker said to me. To paraphrase Julian Cope (talking about a band improbably called Tight Bro’s From Way Back When), ‘These guys don’t do low’. Indeed – and not only Texas. If your wine has a healthy domestic market, why on earth would you change its style? 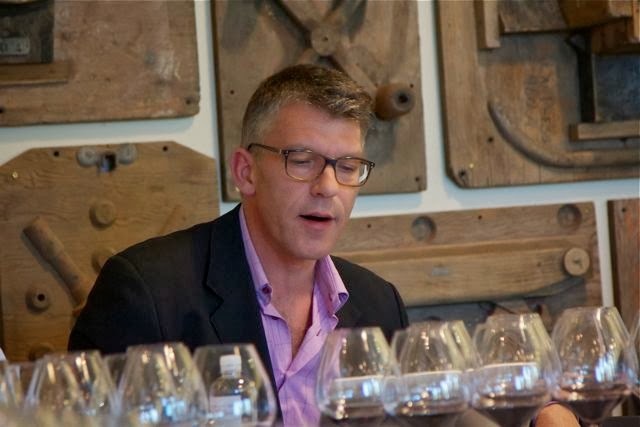 Doug Shafer intimated at a London tasting this year that perhaps to his personal taste the Hillside Select would be more pared-down, but every vintage sold out, so he’d be stupid to do anything different. Reticence and maximalism are held in the balance; the scale might tip a degree here and a degree there but it’s going to take a lot more than a couple of cool vintages and some quietly striving winemakers to have any noticeable effect. 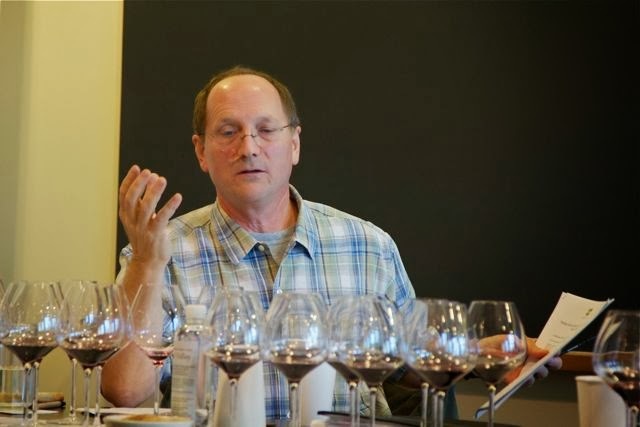 Napa mountain vs valley floor: a tasting held at St Helena in the Napa Valley to determine stylistic differences between Cabernet Sauvignon grown in mountain appellations and on the valley floor. 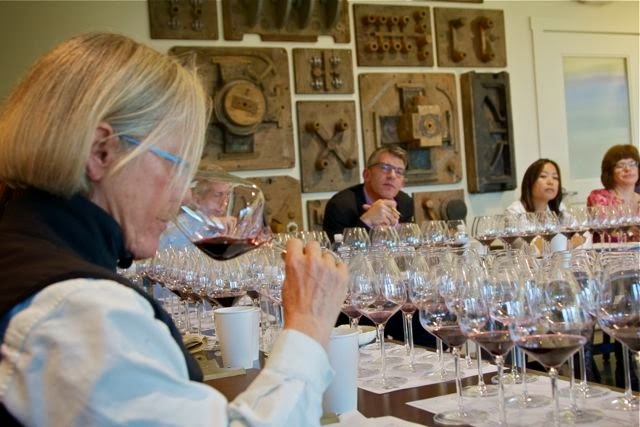 I chaired this tasting in early November 2013. 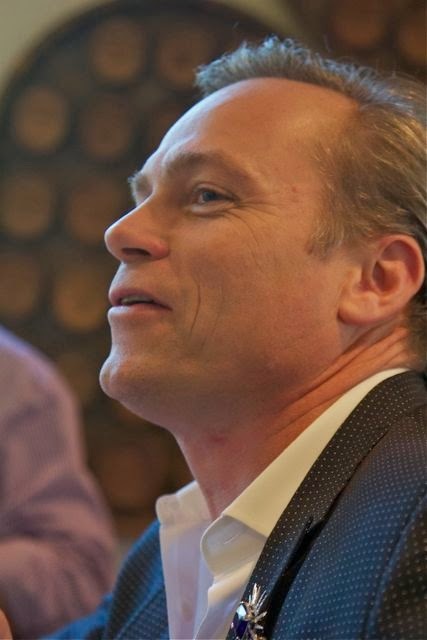 Panellists: Chris Howell, Tim Mondavi, Cathy Corison and Jean-Charles Boisset. Organised with superb efficiency by Patsy McGaughy at Napa Valley Vintners. 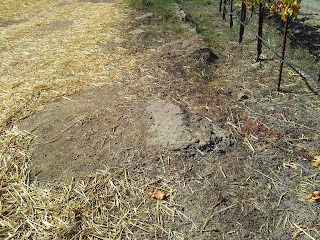 The idea was to tease out the differences between mountain – or hillside – Cabernet Sauvignon, and valley floor or benchland fruit. In the morning we did a walkabout tasting with around 40 wines, blind but separated and labelled mountain or valley floor, with one table of ten wines completely blind. The afternoon panel tasting featured 12 wines, non-blind, which we tasted in flights of four: two valley floor and two mountain. List of wines below. In two weeks of Cabernet Sauvignon tastings in the horseshoe of Napa mountain AVAs, from Mount Veeder in the south (from whose southern vineyards you can see see downtown San Francisco) to Diamond Mountain and Howell Mountain in the north, back down to Pritchard Hill and Atlas Peak in the south, I heard as many definitions of mountain or hillside wine as I had conversations. 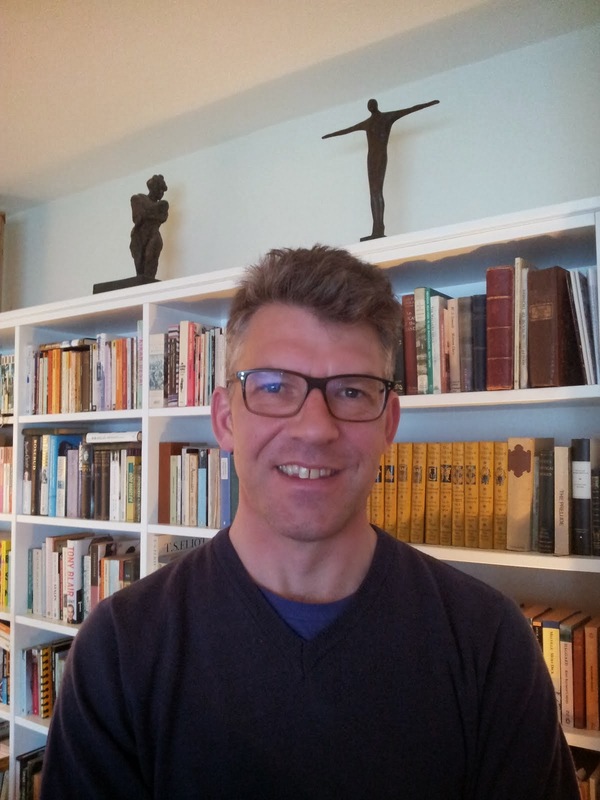 There is the political, as succinctly put to me by Stuart Smith of Smith Madrone: there’s a conflict between lowlands and highlands. Producers on the valley floor resent us up in the hills, mainly because with the current draconian Hillside Ordinance they can’t get up there themselves (the Smith brothers, or Peter Newton, would never have been able to plant their high vineyards had they not done it before the ordinance came into effect). Further development is hamstrung with bureaucracy. Many would disagree of course – if it wasn’t for the regulatory constrictions, the hills would be carpeted with vineyards. 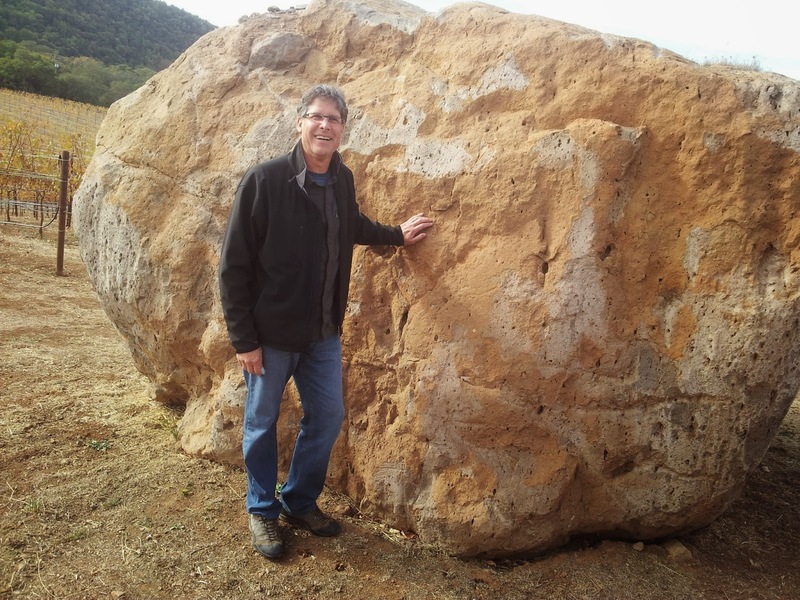 Rudy Von Strasser at his winery on Diamond Mountain has another view: mountain wine is more of a marketing hook than anything else. His point is that there are so many stylistic variables – some mountain vineyards have very expressive fruit, some valley floor wines have the elegant austere profile that you would expect from altitude – that searching for stylistic pointers is difficult if not impossible. 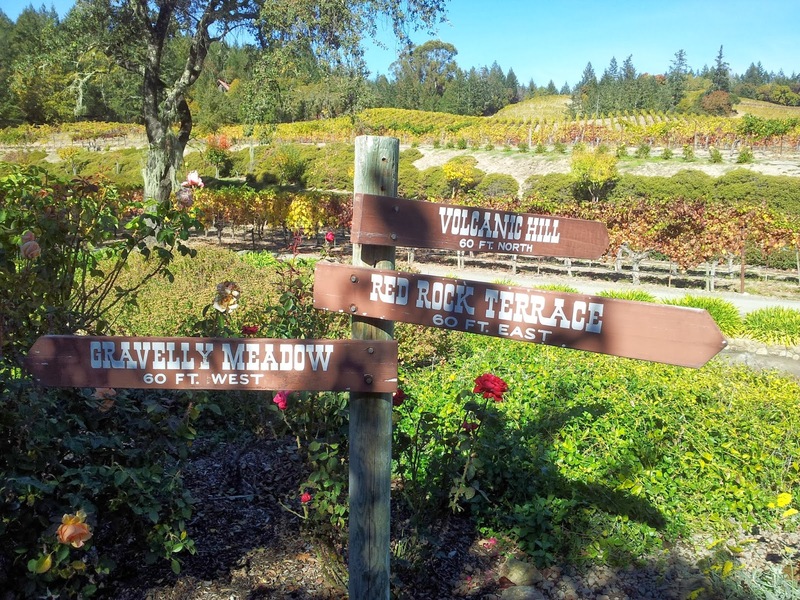 There are five AVAs (American Viticultural Areas) in Napa that can be described as hillside or mountain. On the Mayacamas range on the western side of the valley are Mount Veeder, Spring Mountain and Diamond Mountain, and on the eastern side – the Vaca range – are Howell Mountain to the north and Atlas Peak to the south. Just north of Atlas Peak is Pritchard Hill, not an AVA, but home to Colgin, Bryant, Tim Mondavi’s Continuum, Dalla Valle, Chappellet – the latter one of the great Napa pioneers. 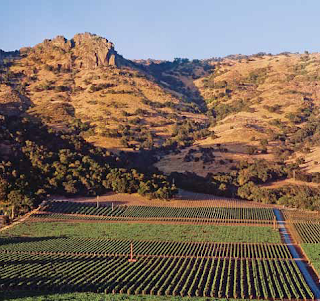 The mountain AVAs average 600-2000ft [182-609m]); the highest vineyards sit at around 2,600 feet [792m] on Atlas Peak. 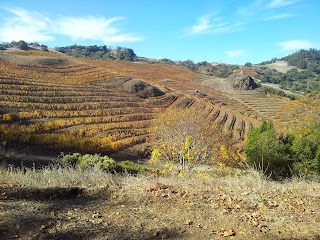 The hills are more exposed to prevailing winds, giving more stress to the vines. 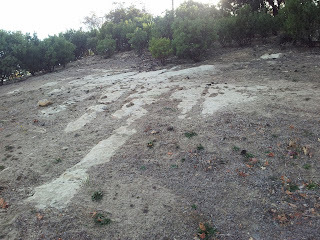 Slopes are steeper – sometimes even vertiginous - terracing is common. to several metres. In many areas, rocks break the surface of the ground. Use of dynamite and drilling equipment is common when planting. Ann Colgin told me it took a year to prep her land on Pritchard Hill, using '12 giant earthmoving machines and a bit of dynamite'. 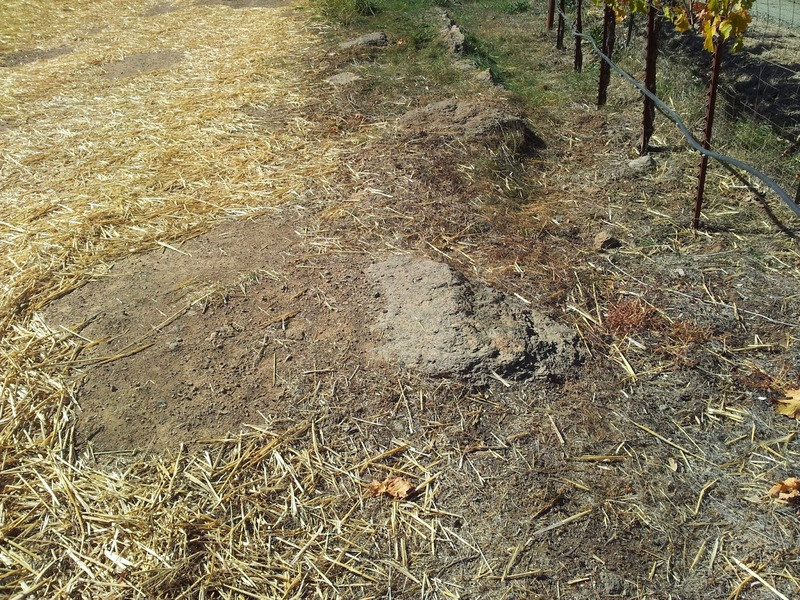 It’s worth mentioning that this makes mountain viticulture a very expensive business – planting is difficult when you have to remove several hundred tons of car-sized rocks (preparing and planting a mountain vineyard can cost anything up to US$200,000 an acre) and different ripening times within blocks require many passes at harvest. Some vineyards will be separated into a dozen or more blocks for separate picking and vinification. 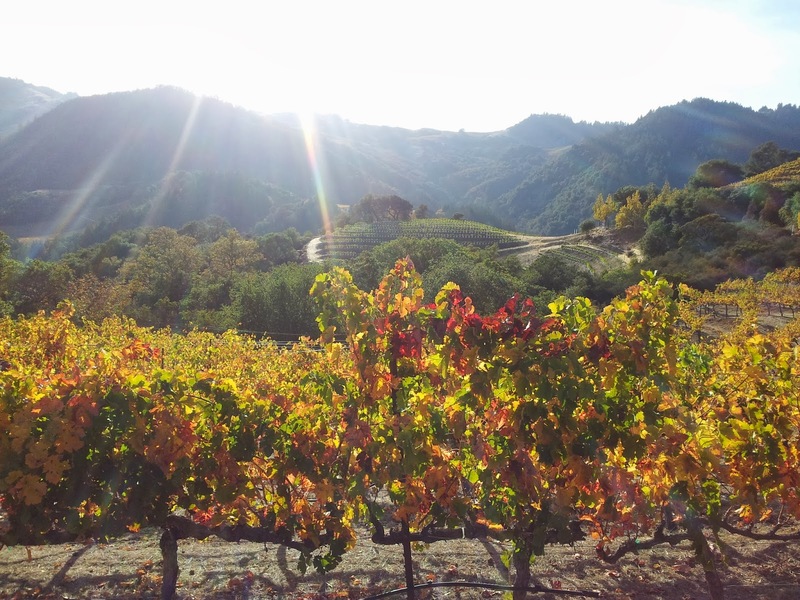 Mountain wines tend to be produced in small quantities from land that is extremely expensive to farm: from Colgin to Bryant Family, many of the Napa ‘cult’ wines are from the high ranges. Orientation is very varied. 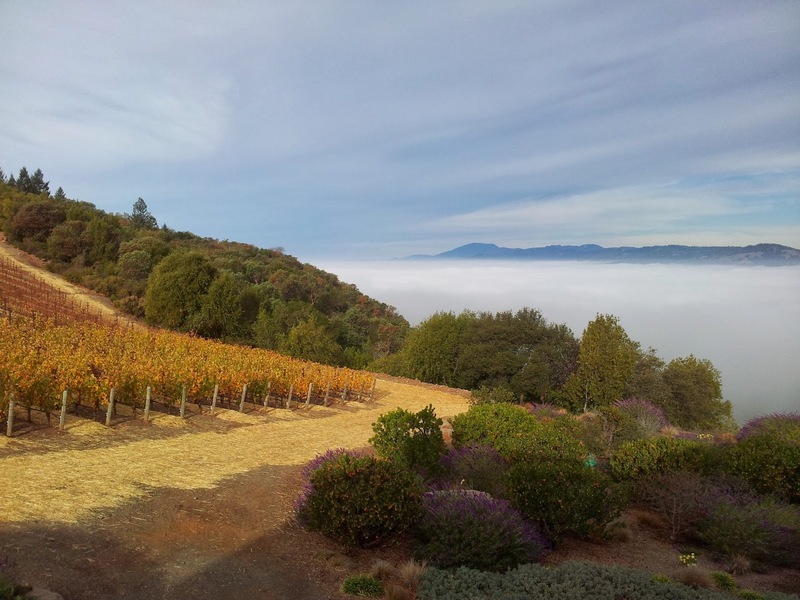 A vineyard like Dino Cimarossa’s on Howell Mountain curves around the hilltop facing four different ways at once. 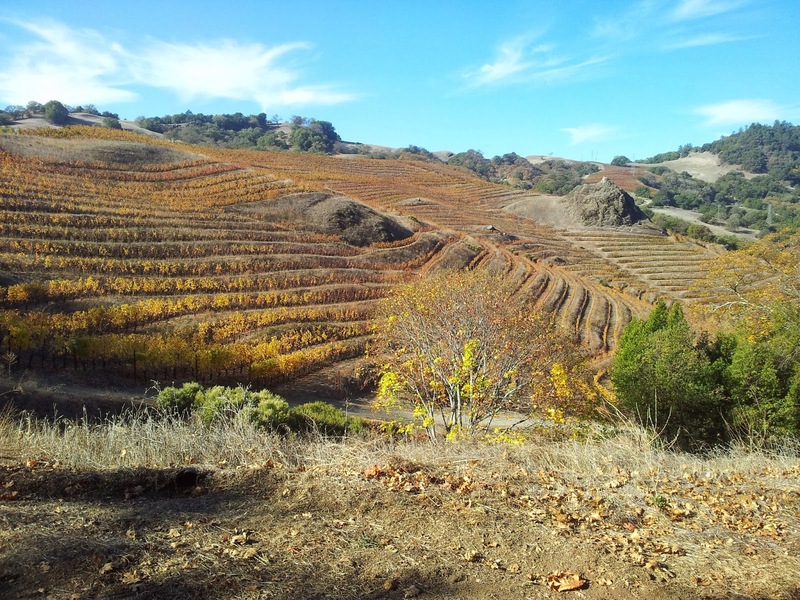 One the most interesting characteristics of Napa mountain AVAs is that they are anomalous: unlike many other mountain regions around the world, they can’t be described as cool climate regions. The inversion layer means that cooler air in the valley pushes hot air upwards: night-time lows can be higher than valley lows (up to 11C warmer), but the daytime highs are lower than on the valley floor – afternoons tend to be cooler. Temperatures hardly ever get above 100F, considerably cooler than valley summer temperatures. Mountain regions tend to be drier - there are no summer days of intense wetting from the fog – and they are seldom affected by frost. 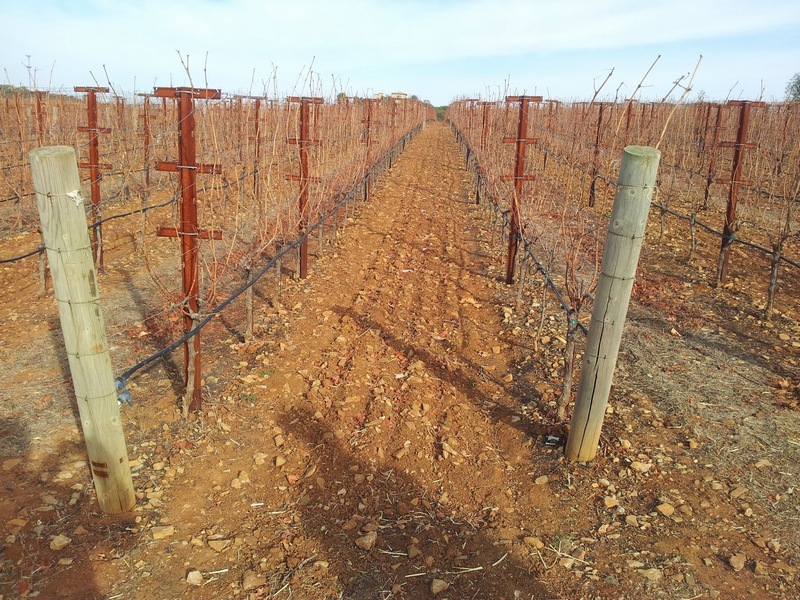 There’s variation in temperature between the AVAs. Diamond Mountain in the north is one of the warmest regions, while Mount Veeder, which abuts Carneros and is a few miles from the Bay, is cooler. Vines in the mountain AVAs are stressed, by wind exposure and by lack of water. 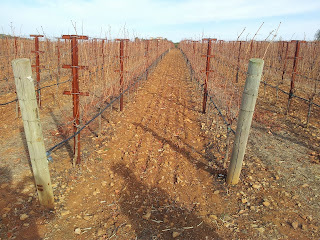 They are smaller, less vigorous – six- or seven-year-old vines can look like two-year-olds. Bunches are smaller, especially Cabernet: it’s common to see bunches no bigger than a fist. Berries are smaller with thicker skins – the skin to juice ratio is half what it is down in the valley. Harvests are later than below in the valley – generally by about two weeks – the grapes hang longer but typically are picked at lower sugar levels - 25 degrees brix, as opposed to 27 degrees and higher on the valley floor. If red winemaking is all about tannin management then this is never more true than for mountain fruit – every winemaker I have spoken to has the same story: the biggest challenge is handling the tannins in Cabernet. 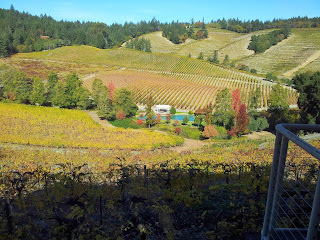 Peter Rubissow describes his vineyard on Mount Veeder as 'like a racehorse - very powerful and difficult to handle'. Intervention is minimal; cold soak, gentle pumpover and punchdown and infrequent racking are common. Wines have fresh natural acidity and tannic grip and often a mineral character. Red or blueberry fruit (there's much debate about this: Dawnine Dyer on Diamond Mountain for example reckons 'fruit is more black than red'; others see blueberry, red cherry, redcurrant. My notes tend toward the red side of things, even to raspberry in the older wines); green spectrum – herb, hay and sage rather than capsicum or fresh-mown grass. There’s also often a certain rusticity, as put to me by Chris Millard at Newton. He describes his wines as rustic, a term that can be pejorative in Europe, but Millard sees it as the difference between wild rather than cultivated fruit: a wild briar with small intense blackberries and those big, perfect, clean cultivated blackberries you buy in the supermarket. Again, there are different views. 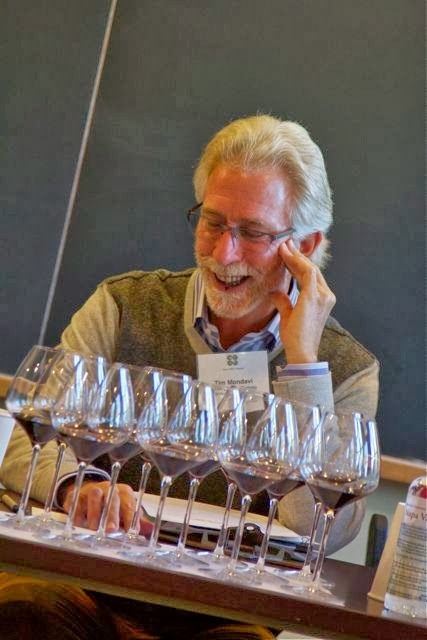 Here’s Robinson on tannin and fruit differences: ‘I felt the hillside wines had better integration of their tannins so that, while brooding, their intensity was well-harmonized with the rest of the wine’s components. Generally I get darker fruits and greater salinity and savoriness on the hillside wines, more red fruit and candied qualities on the valley floor. 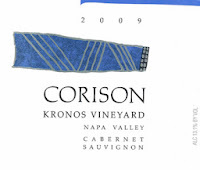 For Corison, this is due in large part to relative acidity and pH values. Unlike many mountain regions, Napa’s high vineyards, because they tend to be warmer at night, produce lower acidity than in the valley. So the two styles can be distinguished by their structural differences, Corison said. ‘We are in the fog, we have cooler nights, and we keep this snappy acidity.’ The higher pH of mountain wines was the one ‘consistent thread’ that ran through the tasting, she concluded. Stephen Brook, Jancis Robinson and Margaret Rand did a similar exercise in London for World of Fine Wine in 2010 (Issue 28). Their conclusions were equally opaque: a trio with many decades of experience behind them, they were able to distinguish mountain from valley or benchland Cabernet only 50% of the time. 'In theory, it should not have been too difficult,' Brook said. Deep opulent nose with damson and black cherry and some spice, defined, grippy tannins and robust acidity, earthy freshness to the palate, damp forest floor, even garrigue, hints of parma violet and cedarwood. Fresh minty nose with dense dark fruit, minerality and sour-mash red fruit on palate. Acidity dominates the suave, elastic tannins while the length is saline and intense. Very fine, warm, mouthfilling, powerful but delicate. The nose is very perfumed with cigar box aromas, which carry through to a palate dense with sweet dark briar and stone fruit: blackberry, blackcurrant, damson and plum, agreeably balanced with notes of bitter coffee,. Tannins ripe and juicy with fine acidity. Tar and violets on the nose, restrained, elegant rustic but fine late-developing tannins (rustic in the sense of a fine artisan earthenware pot compared to a bone china teacup). Sweet dark fruit with hints of red – wild raspberry, cherry and nice acidity. Straightforward, precise, not complex. Sweet red fruit - strawberry marinaded in balsamic vinegar – on the nose. Some resiny notes on the palate, all very aromatic and opulent: tar, wood and chocolate. A dense, rather sensual wine. What is the difference between the terroirs? It would take a more sophisticated palate than mine. 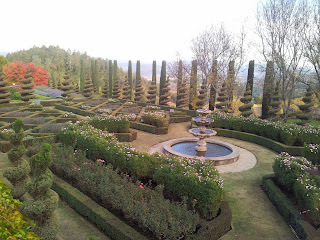 In this St Helena offering I see the same tarry, opulent, perfumed notes as in the Rutherford. The tannins have slightly more grip, I would say, but swap my glasses round and give them to me blind and I’d need many years of tasting the neighbouring AVAs to distinguish them. Lovely wine. Produced in tiny quantities, 24 months in oak. The one slight disappointment of the lineup. An aromatic tarry nose gives way to a bold, bright palate with perfumed, highly-spiced and even raisined fruit. An old-fashioned feel to the wine – dense, powerful tannins and pronounced alcohol burn at the end. Very bright open nose with dense, opulent briar fruit. Very polished, black and red fruit on the palate – redcurrants, cherry, some attractive leafy notes. Classic mountain tannins come late in the palate and give the whole a robust structure. Excellent. Founded the Corison label in Rutherford in the mid-1980s. Described by San Francisco Chronicle wine editor Jon Bonne as ‘a folk hero among those seeking a reprieve from Napa’s overwrought Cabernets’. Director of winemaking at Robert Mondavi Winery until 2004. Now on his 9th vintage of the Pritchard Hill Bordeaux blend Continuum. Longstanding, highly cerebral winemaker at Cain vineyards on Spring Mountain. Wine.com, founded by entrepreneur Mike Osborn, is now the biggest retailer of imported wine in the US, finds Adam Lechmere. And as the growth in Millennial spending power converges with the growth in mobile technology, it’s tipped to get even bigger. Place the pasta in the water and the salt in the water and the water in the pot and the pot on the fire. In the pot? The fire in the pot? No. The water in the pot. The pot on the fire. The pasta in the water? And the salt in the fire? No. The salt in the water. And the water on the fire? No. The water in the pot and the pot on the fire. Not the water on the fire. For then the fire will die and dying be dead. Nor will the water boil and the pasta will drain dry and not cooked and hard to the teeth. The salt falls nor does it cease to fall. The water boils. So be it. Cease from placing your hand in the boiling water. Place your hand in the boiling water and it will cause you pain. bubbled the bubbles still bubbly. Across the kitchen a board intended for chopping. Here. Take it. Chop. What will I chop? There are no ingredients to chop. Just chop. Don't cease from chopping. To chop is to become a man. After 10 minutes. The pasta stiff and dry and upright no more. The pasta lank and wet and soft. In the eternal damp of water. Pour water free like some ancient anointing. The pasta left alone in the pot. Alone and naked. The salt? Where's the salt? The salt is gone. Lost to the water and gone forever. I grieve for the salt. It is the salt for which I grieve. Yes. Tip it out. Onto. in your memory anywhere of anything so good. Now the pasta is eaten. Leaving just full stops and And.